The Zenith carburetor on the Ford Industrial LRG-425 engine of my chipper is on it's last legs. It's been rebuilt several times but is badly corroded, the butterfly shafts bind and it has air leaks somewhere that are not from warpage. The engine runs pretty bad right now. NAPA referred me to EC Distribution as the local distributor, who wanted $2443 for a single barrel Zenith carb. ????? I had somewhat the same issue with a carburetor on a Chrysler slant six industural engine in a forklift. The carb needed a tune up kit, nobody had a kit, finally a local mechanic who works on old Fords recognized the parts as being identical to an early fiftys Ford six cylinder pickup engine. All kinds of them available, at that time anyway. Maybe find a website where Ford folks hang around, somebody will have a light bulb come on. Ken, funny you say that. I have several Ford LRG-425's on our equipment, they're all EFI though, no carburetors. You may also want to look at different suppliers, one of the backup generators we have at the farm is a big Coleman Powermate, a "PM402511" I believe and it also has a LRG-425 on it, but it's propane-powered. I do know they were available in gas, natural gas & propane versions. Check Flea-Bay, they're must be lots of alternatives out there, gen-sets for one are notoriously long-lived so parts must be too. Turns out the LRG-425 is exactly the same engine that was put in the Ford Ranger from 1998-2001 but those are all injected. The smaller displacement LRG-423 was used in the Pinto from 1974 on and in other applications through 1997. A Pinto carburetor may work with some tweaks - it's a 2bbl with a different mounting pattern but it could be probably swapped in with a different manifold. It's funny that within the last year Surplus Center was selling complete LRG-425 engines for less than the quoted price for the carburetor. Those Ford engines were used on Bobcat brand skid steers too. And Mustangs and Mavericks from the 80's. My buddy took out his bad 4-cyl. 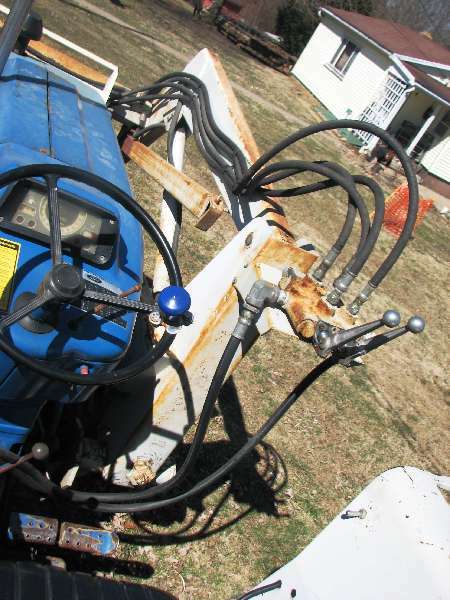 in his Bobcat and shoe-horned a V-6 from a Mustang--with exytensive body mods to the skid steer. According to him even the engine mounts were the same. Like Tim Taylor from TV's Home Improvement would say Ar-ar-AR--ARrr More Power! The 2bbl carb on my dump truck--they wanted $1800 new. A buddy gave me a really worn out one and I had that one rebuilt locally for $300. It looks and acts brand new now--they even recoated it to match the old greenish anodizing. I wasn't sure if they could even rebuild it since nearly everything mechanical was wobbly and loose. The owner let it is slip that the rebuild kit cost about $80, so maybe that's an option and do it yourself. Also there are likely other mfg's that offer a direct or near direct replacement carb. Easy enough to surf the net for it. Found a single barrel Weber 34 ICH carb with manual choke that should fit the manifold and air horn mounting pattern. Not sure about the governor hookup though. $150 shipped brand new from WeberCarbsDirect dot com. I couldn't find a single reference to a direct replacement but this one seems worth a try. Supposedly it was used on the same engine in UK model Ford. Ken, they did make adaptor plates for carbs for different manifolds. Such as 2 barrell on a four and so forth. So if need be you should be able to make one if need be. I haven't found an adapter plate yet. It wouldn't be hard to make one with access to metalworking tools but I don't have that luxury. I could probably swap in a Pinto manifold which would allow three or four different carburetor choices. In the 70's there were some throttle body injection retrofit kits available but I can't find those anymore. I think the biggest conversion obstacle will be to get it working properly with the mechanical governor setup. The next would be to do a bit of wiring so the low oil shutdown works (not all that important really). The Weber doesn't have the electric solenoid of the original Zenith carb. Ken first you may find an adapter if you find a parts person who is willing to "look" at their stock for you. Second it has been a while and my memory may be forgetting some little holes and such but some were very simple. If you could get a flat piece of metal about 3/8 thick you could use a hole saw to drill out the center for the air/fuel and then drill for the studs on the manifold and then drill and tap for bolts to bolt the new carb with. It really should not be hard. If you have any kind of drill press it should be right easy and the tapping would be hand so again easy. You do know you can buy gasket material in sheets of different thickness and place it on top of what ever you need a gasket for and using a small ball peen hammer can either mark or even cut the gasket by tapping along the edges. Remember; "you can do it and we can help". You do have Home Depot near by right? KT, drilling the holes isn't the hard part. Finding the flat stock and cutting the perimeter shape would be the hard part. Actually, fabricating the governor hookup would probably be the worst.